This is our largest rechargeable silica gel canister. It an effective method of reducing harmful moisture in an enclosed area. This size is very popular with larger areas such as safes or gun cabinets. 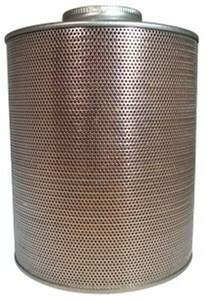 The canister measures 4" x 6" and contains 750 grams (over 1 lb. 10 oz.) of silica gel to protect up to 57 cubic feet. Durable metal construction outlasts paper or cardboard containers. You will know the canister needs to be recharged when the orange silica gel beneath the heat-resistant inspection window turns dark green. To reactivate, place the entire unit (do not disassemble) in a 250 degree F oven for at 2-3 hours. The silica gel will gradually turn orange again and be ready to absorb more moisture. For your convenience, the reactivation instructions can also be found on the bottom of the canister. The units are extremely effective at protecting your valuables such as family photos, documents, silverware, musical instruments, seasonal storage, grain, medicines, clothing, guns, electronics, jewelry, food, leather, coin and stamp collections, tools, collectibles, and other valuables. 750 Gram Rechargeable Silica Gel Canister is ideal for lockers, cabinets, vaults, safes and more. Heavy-duty container is preferred by police armories, hospitals, museums, and collectors. Please Note: When you first use the Silica Gel Canister in a particular area, it may become saturated rather quickly as it absorbs residual moisture. Once the residual dampness is removed, you can maintain a dry condition with less frequent need to reactivate.